A UK university has created two vertical ‘container farms’ capable of producing natural crops which, scientists claim, are more nutritious, have bigger yields and are ready to harvest in half the time. Thought to be the first of their kind in the UK, the farms are housed inside two converted shipping containers and use a variety of innovative and automated feeding and environmental control systems to create perfect growing conditions all year round. Each container farm is capable of producing three to five tonnes of crops a year. Scientists at Nottingham Trent University’s School of Animal, Rural and Environmental Sciences plan to use them for teaching and research – and to showcase the potential for ‘precision agriculture’ in a time of global challenges for food security and safety. Nearly 70% of the UK’s fruit and vegetables currently comes from outside the UK and there is concern that food imports could become more expensive post-Brexit and that there could be significant disruption to the UK’s food supply chain. An increasing world population, climate change, and pressure on natural resources which threaten global food security, are other major challenges. The farms, located at the Brackenhurst Campus, have been created as part of a project with scientists at Huazhong University of Science and Technology in China. 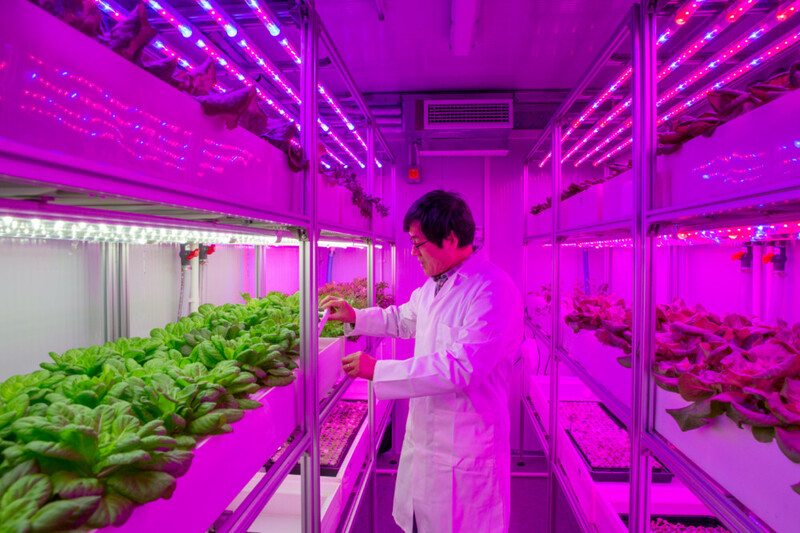 Produce is grown vertically on racks using various LED light and nutrient ‘recipes’ to stimulate growth, depending on the particular species, variety of crop and its different developmental stages. Suitable wavelengths of light enhance plant growth, giving crops higher yields, more flavour and increased nutrition. Plants are also grown using include hydroponics – growing plants without soil in a nutrient-rich solution – and aeroponics, whereby plant roots are suspended mid-air in high humidity, whilst being intermittently misted with a nutrient solution. Unique recipes of the 17 different nutrients which control crop quality and flavour are automatically monitored and delivered to each plant via a software-based control system. Delivering these directly to the roots ensures almost all nutrients are taken up by the plant – hence bigger yields, faster growth and improved nutrition. Only about 30%-40% of nutrients are taken up by the roots when grown in soil. In addition to this, the project tackles the need to increase efficiency of nutrients and the protected conditions of the container mean there is no need for pesticides or fungicides. “We want to address food security and sustainable agriculture issues by developing new farming systems which can provide an improved crop quality and yield,” said Chungui Lu, Professor of Sustainable Agriculture in the university’s School of Animal, Rural and Environmental Sciences. “We believe that there is enormous potential for urban agriculture and ‘”vertical farming to meet these emerging challenges. “Container farms have optimum growing conditions from germination right through to harvest. It is a hugely efficient and sustainable way of growing very fresh vegetables and some fruit all year round. “Container farms the size of ours would be able to produce three to five tonnes of crops per year. Producing natural and sustainable local food under such protected conditions could be very attractive for a range of organisations, such as supermarkets and restaurants.